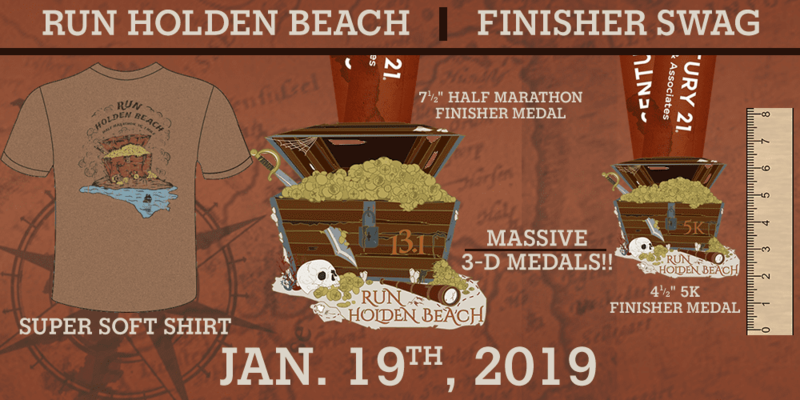 So you’re registered for Run Holden Beach this Saturday (1/19/19) and looking for all of the race details? You’re in the right place! This is a copy of the pre-race email with all kinds of info to make sure you have a great race weekend but if you have any questions, feel free to shoot us an email. See you this weekend! Your BIB # should have been emailed to you but if you registered more than 1 person or need to lookup another bib number, CLICK HERE to look up a registration by name. 1) Click “Am I Registered” on the bottom left side. 2) Type your name in the search bar at the top. 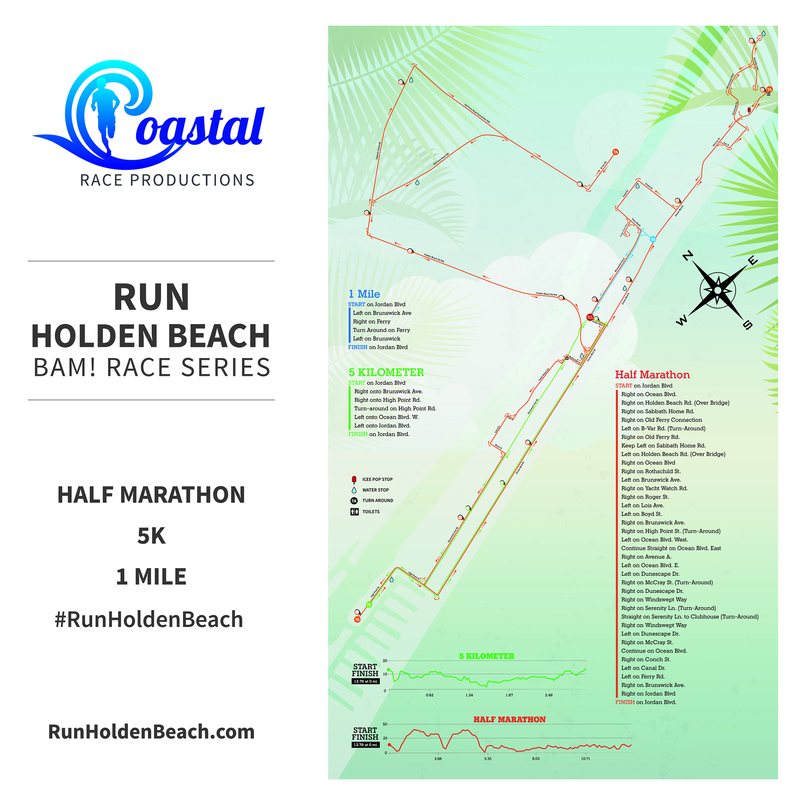 Thank you so much for joining us at the 6th Annual Run Holden Beach certified road race! We’re just a few days out and as we get ready for Saturday January 19th, 2019, we’re covering a lot of the frequently asked questions regarding our packet pickup, parking, race day and policies. Join our event on Facebook. Click “GOING” and “SHARE” it with your friends! We have a cute Mythical Mile Mermaid Medal that all 1 milers will receive. It starts at 8:30am so our 5K’ers have plenty of time to finish up and participate in the 1 Mile. We have limited space available so if you have family/friends that want to run/walk the 1 mile, get them registered now. Or if you’re in the 5K, go ahead and register for the 1 mile to double up on the bling! IMPORTANT! All runners must be over the bridge and on the island before 6:30 for all races! The bridge will be shut down to traffic from 6:45 – 7:30 so if you’re not on the island, you will miss the start of your race! *All parking is ON the island. Carpooling is highly encouraged. You DEFINITELY want to come over the bridge and onto the island to park – click here for directions. The island of Holden Beach has very limited parking and we’ve done our best to secure as many lots as possible for you. We’ve spoken to the local authorities to be lenient on parking tickets. Please follow all directional volunteers in the morning to get you to parking lots and areas we have approved for parking. Sides of roads are allowed – we encourage perpendicular parking and please make sure your entire vehicle is off of the road. Please do not block any race signs. To stay closer, there is the Grey Gull Motel on the causeway. “Do Drop Inn” is on the island and may have vacancy. You may also want to call a vacation rental like Brunswickland Realty or Alan Holden Vacations to see if they will do a short term rental (shorter than a week) as we get closer to race day. We will host a packet pickup on Friday January 18th from 2pm – 7pm at Sabbath Home Baptist Church located HERE (990 Sabbath Home Rd. Holden Beach, NC 28462). We are asking ALL packets to be picked up here on Friday night. If you can’t make it, it’s ok to pick up race day morning – but please come extra early! Yes, you may have a friend/family member pick up your packet. They must have your bib (will be sent closer to race day) and copy of your photo ID. This could be a picture or screenshot on their phone – or printed. The Bridge will be shut down completely from 6:45am – 7:30am. If you don’t make it on the island before 6:45am – you WILL miss the start of your race! This includes the Half AND the 5K participants!! – A Fun Walk/Run on the road – 100% of the money from this race goes directly to local non-profits! Can I swap tshirt sizes? Yes, we will have a shirt swap station based on availability.